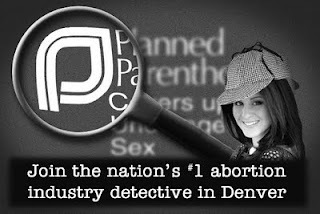 This Saturday - September 26, 2009 - Liveaction.org's Lila Rose will share her story about going under cover into Planned Parenthood clinics to expose their ongoing criminal enterprise. Her "partner in crime" James O'Keefe has this past week been credited with bringing down the nefarious organization, Acorn. Will Lila's efforts bring down evil Planned Parenthood? You can still join us by calling 303-753-9394 for tickets. Student discounts available for youth.